Ad-din Fatema Nursing Institute accorded a reception to its first-year students at Barrister Rafiqul Haque Auditorium on the premises of Ad-din Women’s Medical College in the capital on Saturday. 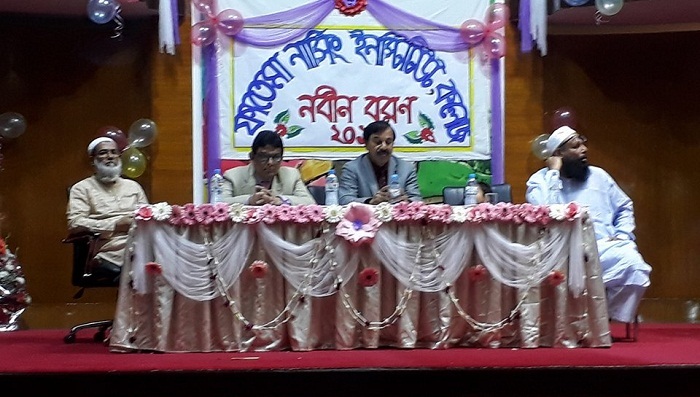 Ad-din Foundation Executive Director Dr Sheikh Mohiuddin, Ad-din Women’s Medical College Principal Dr Arifur Rahman, Ad-din Hospital Directors Dr Tariqul Islam, and Dr Nahid Yeasmin and Director (Education) Anwar Hossain Munsi attended the programme. Dr Arifur Rahman said a person has three duties – duty to Allah, duty to parents and duty to mankind. “A nurse is such a person who is trained to give care to people who are sick or injured,” he said. Dr Tariqul Islam called the job of a nurse noble and said it enables a person to serve the suffering humanity. Dr Nahid Yeasmin said the job of a nurse is very tiring. “She is always busy. She looks after patients and pushes injection whenever necessary. She remains vigilant. She shares the sorrows and sufferings of the patients,” she said. Lauding the role of nurses in health facilities, she said hospitals and clinics cannot go even a single day without a nurse. Caption: Ad-din Foundation Executive Director Dr Sheikh Mohiuddin, Ad-din Women’s Medical College Principal Dr Arifur Rahman and Ad-din Hospital Director Dr Tariqul Islam and Director (Education) Anwar Hossain Munsi attend a freshers’ reception programme of Ad-din Fatema Nursing Institute held at Barrister Rafiqul Haque Auditorium of the Ad-din Medical College in the city on Saturday.